LAX is the international hub for stars in and out of Hollywood, and a few celebrities were among the travelers caught up in the chaos following the deadly shooting at the airport Friday morning. With time on their hands, they took to Twitter to update fans. 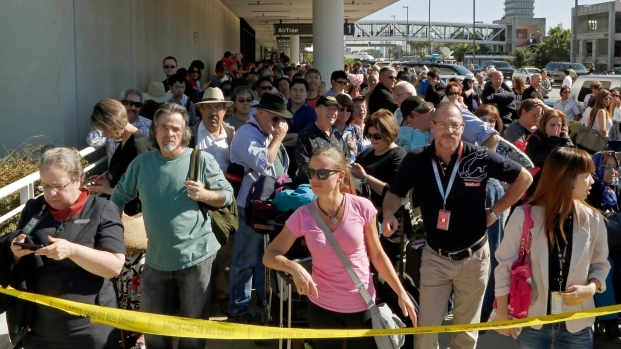 — "At #lax Some (expletive) shot up the place." — James Franco, who included a self-portrait in an airplane window seat. His publicist confirmed the actor was a passenger on a flight that landed Friday morning after the shooting occurred. — "Currently waiting on the plane in a remote parking area. I am safe. Praying for the victims of this shooting." — Nick Jonas, who posted moments earlier that the flight he arrived on was set to deplane at the terminal where the shooting occurred. — "Heard gun shots then everyone starting running for the door. Not sure if anyone was hurt. #LAX" — "Mythbusters" host Tory Belleci posted Friday morning, followed by a series of tweets and photos updating the situation at the airport throughout the afternoon. — "Almost 4 hrs since the shooting. Still here. 2000+ people. They're handing out waters & snacks. #LAXShooting" — Belleci. Discovery confirmed in a statement that he and Grant Imahara were at terminal 3 on route to Delaware when the shooting occurred. — "Otw to lax and I hear there was a shooting at the terminal I'm going to. No Dallas for me this weekend, hope everyone is ok. I hate u LAX" — "Glee" star Mark Salling. 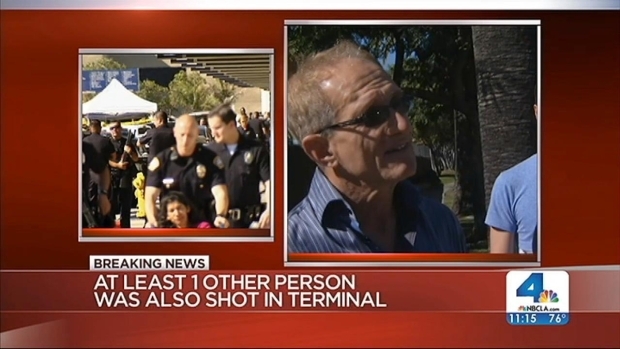 Passengers talk about all the unknowns after a gunman fired inside Terminal 3 at LAX. Jacob Rascon reports for the NBC4 News at Noon on Friday, Nov. 1, 2013.